Hi, my name is Jo. I am an artist and this is a record of my adventures in art. I have high functioning autism which means that, as well as struggling with some aspects of my life, I also see, think and experience life a little differently sometimes. In fact high functioning autism can help with some things as well as hinder with others. I was only diagnosed in 2015 after a 6 month period of evaluation and tests with the NHS. It’s been really helpful for me to get this diagnosis because it helps me understand why I’m a bit different sometimes and why I have so much trouble with some things which most folk find really easy and yet find other things easy which most folks find hard. I really love lots of different kinds of art. Originally I painted contemporary acrylic abstracts using very bright colours, which I see as friendly, and bold shapes which feel straight-forward and genuine to me. Then I went through a period of drawing animal portraits in charcoal. Nowadays I am exploring gouache, ink and watercolour and especially working on developing a watercolour style which is close to the Japanese Shin Hanga movement which I adore. I’m also a huge fan of comic books, especially Star Wars and Judge Dredd. I love all of the artwork associated with Megacity One and my favourite galaxy far far away. With Judge Dredd I love Cam Kennedy’s work and Ron Smith’s most of all. With Star Wars I enjoy everything from Ralph McQuarrie’s original conceptual art for the first film, to the fabulous work by Dark Horse on the Star Wars comic scene, to the 3D animation of The Clone Wars and Star Wars Rebels, to the new Marvel comic artwork with the amazing and rather odd new character, Aphra. I’m also into comics from World of Warcraft, DragonAge and other Fantasy D&D comic series. I enjoy some Manga and Anime – especially Bakuman, Bleach, Picasso and Naruto. My favourites though are Pluto by Naoki Urasawa, Planetes by Makoto Yukimura and Brody’s Ghost by Mark Crilley (which is an OEM). I think they’re sublime. When I’m not doing arty stuff I am also a mum, a qualified teacher and a software engineer. I’m working part-time in KS1 special needs at the moment. Unless otherwise specified on each page, all images on this site are copyrighted to Jo Fox 2013, 2014, 2015, 2016, 2017, 2018 and 2019. No permission is given for commercial use of any kind. If you’d like to use any image for non-profit purposes please contact me via the comments explaining what you’d like to do and I’ll be happy to sort something out. Without explicit written permission though all rights are reserved. Thanks! I don’t mind you using the image so long as it’s credited where you display it and I retain copyright. (Just means you can’t sell it or Trade Mark it). Hope thing go well with your music! Great portfolio of your art, Jo. Look forward to your future stuff. Peace. Thanks for your encouraging message. With autism and art we’ve got quite a lot in common! I am feeling better now – thanks. 🙂 I took the whole weekend to rest and my body is behaving itself much better now! Lovely to hear from the Emerald Isle! Jo I thank you for liking Surealworld art. I like you have had to struggle twice as hard to accomplish what people normally find easy to learn. When I have to learn a new computer program which has a lot of step to remember, I am all thumbs. Once I have been exposed to a new complicated subject a couple of times then I being to absorb it into my memory. Then once I have confidence that I know the newly learn subject , I can excel. I had this same problem with doing long division in high school, if I am not sure I got the correct answer to the first problem , my mind can’t concentrate on the next part of the mathematical problem . In math class I would be assigned 6 page of math to accomplish and I would only complete two pages. Some beautiful work on here, Jo. Keep up the good work and best wishes with it – really excellent stuff! Hi Jo. Just wondered if you’d seen this offer: http://my.smithmicro.com/manga-studio-5.html?utm_source=smithmicro&utm_medium=email&utm_campaign=clipxmas20161219&_hsenc=p2ANqtz-_Kz79E0EOp6AmfJQ9MJ3clAB6dPOEEc_m9rf7zjGedrW8E58oV7di5pfpU5lFDF13I-i5JJleZ1iitf0MWj1i9zXpD-w&_hsmi=39369030 ? 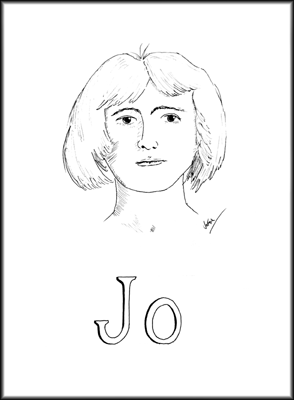 I hope you achieve your ambition of becoming a professional artist Jo! There is no reason why you should not be able to earn money from your talent if you keep at it. I taught art for a while and have sold (more given away!) a few paintings! Thanks for checking out my site. I love your work, Jo! It is outstanding! I like your use of bright colours, as they just don’t work for me – no matter how hard I try, I seem to drift off to mellow. I will enjoy following your adventures! Keep up the good work!